Donald Trump has a gift for hyperbole, but he is correct about one thing: The United States should not stand by while other nations capture the world's emerging markets. Unfortunately, Trump himself is creating the biggest threat to the most dynamic market opportunity of all. Very sad. I'm referring to the President-Elect's threats to pull the United States out of the Paris climate agreement, to refuse to join other nations in helping finance renewable energy progress in developing countries, and to scuttle the progress the Obama Administration has made on cutting carbon pollution here at home. Trump and the next Congress should think long and hard about how these actions would square with his promises to "unleash an energy revolution that will bring back new wealth to our country", "create millions of new (energy) jobs", "protect clean air and water", and "declare American energy dominance a strategic economic and foreign policy goal of the United States". There are suspensions of reality in those promises. Drilling for more oil and gas is hardly revolutionary. It is what we've been doing for generations, except deposits are getting harder and harder to reach these days. Trump's promise to double-down on domestic oil production might allow us to dominate the industry, but it would also make us more vulnerable to foreign manipulation. As many experts have long explained, the world market determines oil prices. The more we depend on oil, whatever the source, the more vulnerable we are to market manipulations by other countries. The U.S. oil industry is only now beginning to recover from the well closures and job losses of the past two years, caused by OPEC's attempt to put American oil companies out of business. When it comes to American jobs, the most egregious of Trump's intentions is to pull out of the Paris deal, the product of 21 years of international negotiations. The accord is designed not only to dramatically cut carbon emissions; it also will stimulate international investments in clean energy, a market the United States is well-equipped to lead if we seize the opportunity. Hyperbole aside, the necessary transition to clean and renewable energy is one of the largest global market opportunities of all time. If Trump or Congress manage to pull the United States out of the accord, they might as well have handed our most sustainable energy jobs to China. The Americans hurt most would include the blue-collar workers who played a large part in Trump's election. Let's review a few facts. The U.S. International Trade Administration (ITA) reports that despite low prices for fossil fuels, "Technology improvements, cost declines, and the catalytic influence of new financing structures, have turned the (renewable energy) sector into a driver of economic growth - both in the United States and around the world. The renewable energy industry remains one of the most vibrant, fast-changing, and transformative sectors of the global economy." The renewable energy sector employed 8.1 million people worldwide in 2015 according to the International Renewable Energy Agency (IRENA). Sixty percent of those jobs are in Asia, including 3.5 million in China. 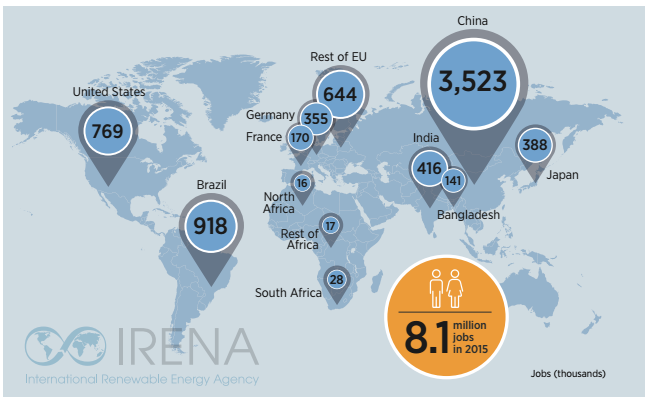 Only about 9.5% of the world's renewable energy jobs are in the United States. The competition for energy jobs is far from over, however. 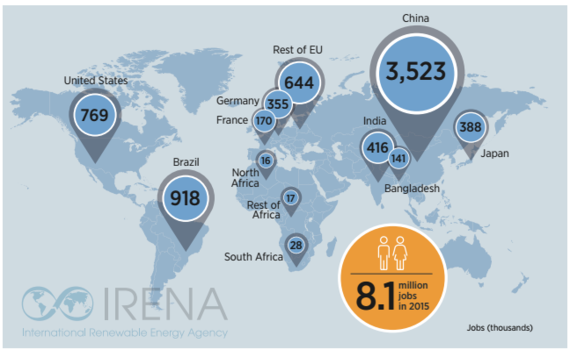 IRENA expects there will be 24 million jobs in the clean energy sector by 2030 if nations keep their commitments under the Paris climate agreement. Solar and wind power, already the world's fastest-growing sources of new electricity, have enormous growth potential. Nearly one of every five people in the world today (17%) lives without electricity. To help developing nations develop, to alleviate Third World poverty and to allow advanced economies to decouple prosperity from carbon pollution, clean energy technologies are expected to attract more than $13 trillion in investment over the next 15 years. If the President-Elect has any doubts that clean energy is good business, he should read the letter that 365 corporate leaders and big investors sent him recently, urging him to keep the U.S. in the Paris agreement and to leave the Obama Administration's low-carbon policies intact. The business leaders warned that "failure to build a low-carbon economy puts American prosperity at risk" while "the right action now will create jobs and boost U.S. competitiveness". Meantime as Trump collects examples of manufacturing jobs lost to other countries, he should look at solar and wind energy technologies. The solar electric industry was born in the USA in 1954 at Bell Laboratories. The first wind machines to produce electricity were created in 1887 and 1888, almost simultaneously in Scotland and Ohio. By 2010, there were more than 580 wind farms operating in the United States, generating enough electricity to power 10 million homes. But America let its leadership slip away. In 2010, China passed the U.S. for the first time as the country with the most cumulative installed wind power. The United States and China have been trading the lead ever since. Based on today's sales, 5 of the top 10 current wind turbine manufacturers are Chinese companies; only one of the top 10, General Electric, is from the U.S. China supplies about 70% of global demand for solar cells and modules. It was the world leader in 2015 in renewable power, biodiesel production, hydropower capacity, solar PV capacity, wind power capacity and solar water heating capacity. In contrast, "U.S. exporters are relatively ill-positioned to benefit from rising demand globally" because of "missed opportunities in certain key markets", according to the ITA. U.S. companies are projected to capture only 5.6% of the global import market for clean energy technologies through 2017. China dominates investment, too. Global investment in renewable power was $266 billion in 2015, more than double the amount invested in new coal- and natural-gas-fired power generation. China led the world with 36% of the total. Whether international renewable energy markets continue their rapid growth depends on enlightened public policies. The ITA cautions that "The renewable energy sector is so reliant on policy that any policy changes - either positive or negative--will have an almost immediate impact on a market's attractiveness." For now, the policy environment is relatively good. At the end of 2015, at least 173 countries had renewable energy targets and nearly 150 had policies that supported renewable energy. As part of the Paris agreement, 147 countries including the United States have promised to increase their commitment to renewable energy. However, the fate of the Paris accord is uncertain if the United States reneges. Responding to Trump's threats, many of the signatories to the Paris agreement have promised to continue working toward its goals. But it is difficult to believe that the Paris pact can be successful without us. We are the richest nation in the world on a per capita basis; one of the world's top oil producers; the world's second-largest source of carbon pollution; and second only to China in energy consumption. We have both a golden opportunity and a moral responsibility to lead the world in confronting climate change. To be a trusted business partner in the international community, we have an obligation to keep our promises. But as the Atlantic has reported, "If the Trump administration withdraws the United States from the Paris Agreement, the country would face a massive global diplomatic backlash and permanently cede worldwide leadership on climate and renewable-energy issues to China..."
We heard a lot of pronouncements from Donald Trump as he campaigned for the presidency. Ceding the world's biggest emerging market to China was not one of them.